You can see that 2nd note at the bottom says one of the factors is 'time since most recent account opening is too short' Which means I'm being dinged on my score because I've recently opened a new line of credit which in this case is that new Chase credit card. However when I looked on my report history it shows my score going from 824 to 811 in the history. I captured my score in screen shot as 816 back in November so I'm not sure why they're saying it was 824. Maybe my score went up from 816 to 824 and then went down to 811? I"m not sure. I've got an unexplained discrepancy of 8 points. 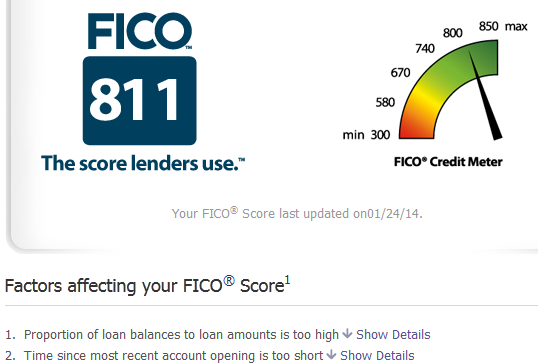 Either way I know that that new credit card caused my score to drop 5 or 13 points.